As with airplane simulators, RC helicopter flight simulators have come a long way. From weak graphics, they have evolved into programs you can immerse yourself in. 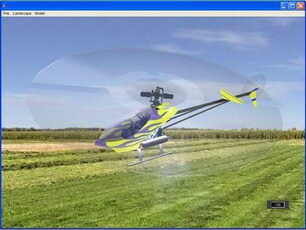 The remote control simulator software for helicopters is very similar to the airplane software, and in most cases is sold as a single package. 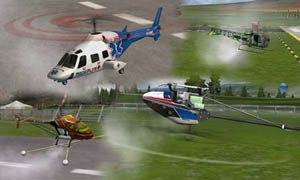 In other cases, the helicopter simulations are sold as add on programs to the main software. The RC helicopter, like its real counterpart, is quite a bit different in its handling and flight characteristics from an RC airplane. If you are planning on flying RC helicopters, it is important to make sure that your selection is designed for them and not just for airplanes. The basic difference in helicopter flight and airplane flight is in the taking off and landing. 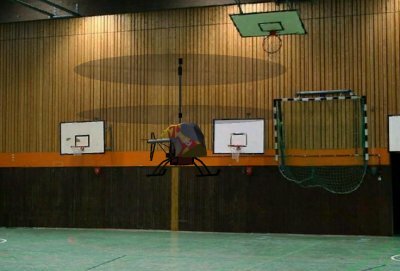 The helicopter does not need a runway, and its ability to move straight up and down as well as hover requires much less space for flight. This is one of the things that have made RC helicopters increasingly popular in the RC hobby field. The top rated simulators for airplanes are also the best for helicopters. An example is the Great Planes RealFlight B3.5 simulator. This top of the line software program comes with an assortment of airplane and helicopter types. It also features a great many "add on" to increase the number and variety of models. Each add on gives you something like fourteen different planes and four or five new helicopter models from which to chose. Some RC simulators are available online as downloads. One of the highest rated of this type is the Clearview RC Flight Simulator. Although you have to pay to download the software, this is a very advanced simulator. It is especially attractive to helicopter fans because although the program is for both planes and helicopters, it talks of its helicopter models first as if they are most proud of their variety there. The Clearview RC Simulator is designed to use a variety of controls. It is possible to control it via your keyboard. For advanced users, a handheld transmitter is used and attached to the PC with a USB cable. The ability to simulate all types of conditions and flying areas and control the program with a transmitter similar to the actual one is the true advantage of RC simulation programs. It is a way to learn to fly your RC model in safety. It is the place to learn without risking your expensive models. There is a certain amount of risk involved in RC flight, but the trained operate can minimize this greatly. I've started making models to fly in ClearView. I use AC3D and build many from scratch. This is far cheaper than building a real model but it is almost as rewarding when you see it fly in ClearView. This is also handy when there is not a copy of the model that you have available. My first ever R/C heli, a very much modded "Wee Jock" could not be found anywhere as there is only one model in existance and I find that flying a "similar" model is not the same. See attached ClearView image. On the other hand models of the rest of my stock fleet are easily available. One major problem is the lack of "Helicopter Parameter" file information, planes yes but helis no. You just have to fiddle about and hope for the best but it can fill in a winter evening or two. This is a later ... much later addition to this thread and I hope can get it going again as there must be many updates / new versions out there since this thread first started. a) USB Tx supplied with RC Planemaster ... this works without any problem and gives full control as HeliSimRC can supply the swash mix etc. needed without need for programming on the radio. I have tried other Sims and can honestly say that FMS is very poor compared to HeliSimRC ... in fact very poor in all models and I have downloaded loads trying to find one that flies as per reality !! Clearview - I liked that and graphics were very good ... but sadly I'm a scrooge and won't pay ... so the Demo ran out ... back to HeliSimRC. RF and Phoenix .......... Yes very nice - but they should be as they cost so much ... in fact IMHO - they are outside reasonable bounds for pricing regardless of savings against crashing the real thing. So I'm back with HeliSimRC for Helicopters and Planemaster for fixed wing ... both reproduce models realistically enough for me. What I like is that they show control inputs BEFORE leaving ground. FMS and others are very poor on this IMHO ... FMS in fact if you give back cyclic or up elevator - tail dissapears into the ground !! So lets get the thread back current and then all those new members to the forum can read up on essential Sims !! I have a copy of Planemaster as well, a present - never bought it. Surely at £19.99 GBP + shipping it can't be much less than ClearView. I just use the controller that came with it. The rest was more like a game than a simulator. The Planemaster has an ME109 that is spot on with the RTF Lanyu I bought - so I'm lucky that HeliSimRC has trex 450 and RC P has the Me109 ... mimicking my flight inventory at this time ! Planemaster like I said Solentlife, I learned long ago to say "Thank you" for gifts and not say that I really wanted something else. In every transaction there are gains and losses, the trick is to look for the gains and balance it out. The controller has stood me in good stead for years. Probably the software has improved some by now. You were lucky to find a model that suited, there was only the controller for me - but I like it! I have to say I was surprised about the controller with Planemaster ... it's remarkably good and mimics a Tx well.